The state-sponsored revival of ultra-nationalismin Croatia is a danger to all of Europe, but its most immediate victim stands to once again be the Serbian people. This vicious ideology has been creeping to the forefront of official Croatian politics for years already, having burst out like a demon in the 1990s but intentionally put on ice during the 2000s while the country went through the process of joining the EU. 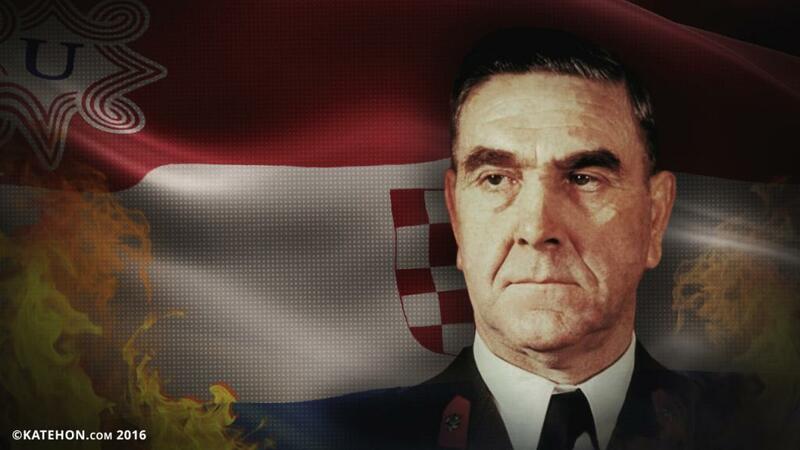 Now that they’re a solid member of both that bloc and NATO, Croatian ultra-nationalists have a free hand to run wild with their fascist fantasies and rehabilitate internationally recognized criminals as so-called ‘national heroes’. Croatia’s accelerated socio-ideological degeneration is taking place in the context of continuously tense intra-federal relations within Bosnia and amidst the Macedonians’ second victory against the US’ Hybrid War aggression against them, the latter aim of which was to sabotage the future route of Russia and China’s multipolar megaprojects of the Balkan Stream gas pipeline and Balkan Silk Road high-speed railway. The timing of this development therefore cannot be seen by any responsible observer as merely being a random occurrence, especially because of the visibly high level of state backing for the neo-Ustasha movement. This is a deliberate policy on behalf of the upper echelon of the Croatian leadership, which at this moment is represented by former Assistant Secretary General for Public Diplomacy at NATO Kolinda Grabar-Kitarovic, the current President of Croatia. Being an expert in information warfare and ideological manipulation, she knew exactly which moves her government had to make in order to most efficiently speed up the country’s fascist revival, and judging by all present indicators, her policies have been a stunning ‘success’ thus far. The reason that they were encouraged to proceed with such urgency is because the US no longer has as much of a chance at destabilizing the Republic of Macedonia as it did last year, and accordingly, the subversion of the Central Balkans must move northwards in response. The situation in Bosnia is always unstable by the very nature of the state’s artificial composition and internationally enforced unity, but it’s lately been getting direr as Sarajevo played its hand in revealing its unstated intention to gradually dismantle Republika Srpska’s sovereignty. This plot has yet to succeed, but it’s importantly been exposed and all Serbs are aware of it, just as they are of Croatia’s return to state-supported fascism, but most people have yet to join the two together in forecasting the most likely intersection of these two closely related anti-Serbian trends. It seems all but inevitable that if Croatian fascism is left unchecked, that it’s only a matter of time before it spills over into divided Bosnia and disastrously unbalances the already precarious state of affairs there, possibly even leading to a return to civil war and a Donbass-like scenario for Serbia where Belgrade feels extremely pressured to possibly intervene. This forecasted sequence of events relates to the larger Great Power geopolitics surrounding the Balkan Megaprojects because Serbia’s involvement in a neighboring military conflict – provoked and pushed over the edge by American-encouraged Croatian fascism – could lead to very unpredictable consequences for the region and possibly create enough instability that the said multipolar initiatives are frozen or outright cancelled. The problem with this unipolar-concocted plan is that it’s not entirely guaranteed to destabilize the Serbian transit territory through which the gas pipeline and high-speed railroad are expected to pass, which directly leads to the complementary ‘backup’ scenario of engineering a Hybrid War in Vojvodina. The outgrowth of Croatian fascism could go east as easily as it could go south, which in that case would lead it to infecting the minds of some of the most radical Croats in Vojvodina. As it stands, an almost statistically insignificant percentage of less than 3% of the people in this autonomous province are Croats, meaning that in and of itself, it’s very unlikely for this community to stir up a lot of trouble on its own. That changes, however, if one bears in mind that the neo-fascist Croatian state has an ideological-strategic motivation in supporting them, even if it has only begun to do so indirectly and via encouraging statements. This is already ongoing, as can be observed by Grabar-Kitarovic’s post-election comment in which she strongly implied that she views Vojvodina as a separate country from Serbia. Her continued promises to protect the “rights” of ethnic Croats in Serbia imply that they’re being violated in the first place, a common ultra-nationalist claim in Zagreb which has never been substantiated with any evidence whatsoever. While these statements might be disregarded by some as pure rhetoric for her domestic audience, it would be better to err on the side of caution and interpret them as ‘dog whistles’, or subtle signals intended to be understood only by a special group. In this context, the former NATO infowar assistant is hinting that Zagreb wants the fascists among her fellow Croats to spring into action and begin devising destabilization scenarios inside Serbia proper. This mirrors a similar strategy the one that India is applying against Pakistan nowadays through the Baloch. New Delhi wants to up the ante in its proxy war with Islamabad and seeks to move the area of proxy competition away from the previously shared focus on Kashmir and into Pakistan proper by means of encouraging a Baloch insurgency, just as Zagreb wants to expand its rivalry with Belgrade in Bosnia away from that middle ground between them and ‘behind enemy lines’ into Vojvodina. Vojvodina is the most strategic location in all of Serbia to wage an identity-fueled Hybrid War, provided of course that one accepts that identity differences would be used as the driving force for any instability in the region. The importance of this province is that it has an historical uniqueness relative to the rest of Serbia in that it developed within the Austrian-Hungarian Empire and not out of the Ottoman one. Although each Serbian entity’s modern-day formation occurred around the same time in the 1800s, they still experienced different historical memories that could be tapped into by identity-reformulating NGO ‘activists’ to promote a sense of regional ‘separateness’ for Vojvodina. This is the very nature of Fifth Generational Warfare, which is to ‘weaponize the previously unweaponizeable’. In the given example, this takes the form of exploiting the identity uniqueness of Vojvodina (both in historical and demographic terms with its substantial Hungarian minority) in order to create divisions with the rest of Serbia that could then be opportunistically taken advantage of for pressuring Belgrade. Because Vojvodina is an integral and inseparable part of Serbia, the authorities are pressed to respond to any provocations that occur there, unlike the situation in neighboring Bosnia. This makes a Hybrid War in the province a much more enticing trap for Croatia to lay if it wants to produce an irresistible response from Serbia, and keeping with the geopolitical determinants guiding this policy, it’s also much more likely to lead to a cascading chain of events that could offset the Balkan Megaprojects’ transit through this chokehold region. The key objective in any forthcoming Hybrid War in Vojvodina is for the radical Croatian minority-of-a-minority to link up with their likeminded Hungarian counterparts in generating a critical mass of identity-driven destabilization that could attract substantial attention. The most likely ‘partner in crime’ that the Ustasha Croats could find in Vojvodina is the Jobbik nationalists, who have an overlapping agenda of emphasizing ethnic and regional separateness in the province so as to procure disproportionate political privileges over the entirety of its territory. In a future scenario of ethno-regional provocations by the Ushasha-Jobbik alliance in Vojvodina, however isolated or widespread they may be in both objective terms and media perception, any forcible attempts by Serbian law enforcement representatives to restore constitutional order will be decontextualized and deliberately misreported to the rest of the world by the Hybrid War supporters as being ‘state-sponsored nationalist violence against democracy-seeking minorities’. The strategic goal in mind is to use the manufactured infowar surrounding this event to produce a split between the Serbian and Hungarian governments, with Zagreb slyly gaining an inroad with Budapest over the shared interest that they’d both have in ‘protecting’ their respective minority communities from the media-manufactured ‘threat’ of ‘Serbian nationalist government aggression’ in multiethnic Vojvodina. Although the present Hungarian government led by Viktor Orban has no problems with the Serbs or territorial claims over their internationally recognized territory, Jobbik does, and they’re in an influential enough position inside of the country to make a serious domestic scandal out of Budapest taking ‘too soft’ of an approach to the artificially constructed narrative of ‘Hungarian oppression’ in Vojvodina. Moreover, as is the trend in most Color Revolution disturbances nowadays, the far-right Jobbik opposition could team up with the anti-conservative liberals in Hungary in order to create a broad resistance front against Orban, all with the intent of pressuring him into stepping down or modifying his policies towards Serbia by making them more aggressive (regime change or regime tweaking, respectively). The immediate impact of any sudden deterioration of Serbian-Hungarian relations stemming from Croatian-masterminded Hybrid War provocations in Vojvodina would be that unnecessary complications are created for the Balkan Megaprojects. It’s not just that Hungary might end up being reluctant to do business with a Serbian government that it has been led to mistakenly believe is ‘oppressing Hungarians’, but that the political turmoil which might be unleashed in Vojvodina could make it almost impossible for either of the two projects to be built through its territory until the problems are resolved. It doesn’t seem at all feasible that the Ustasha-Jobbik alliance would agitate for, or even be capable of achieving, independence or annexation by their ethnic-state compatriots, but that they’d instead pursue an agenda of Identity Federalism, just as the Serbian Province of Kosovo tried to do right before the war. This is even more dangerous than outright separatism because it has the potential for sparking political change throughout the rest of Serbia and eventually leading to the unitary government’s devolution into a federation of regional-identifying quasi-independent statelets, which would then open up a cartographic checkerboard of opportunities for foreign powers to divide and rule the once-unified Serbian lands. It’s infinitely more difficult to achieve this in the rest of Serbia than it is in Vojvodina due to the different historical experience and demographic situation (Fifth Generational Warfare vulnerabilities), but the country’s northernmost province is a sizzling social laboratory for testing the viability of this concept because of its structural similarity to the Hybrid War-prone Republic of Macedonia. Both territories are of similar size in population and area, and each of them also has as very similar percentage of ethnic minorities concentrated in the border regions. The proportion of the combined Hungarian and Croatian minority in Vojvodina is around 15%, whereas the ratio of Albanians in Macedonia is estimated to be around 17% (having fallen from a high of 25% since the last census in 2002 and attributable to Macedonians’ visa-free travel privileges to the EU, which many Albanians exploited to illegally migrate abroad). What really completes the comparison is that both of these political entities geostrategically occupy a near-identical chokepoint position along the Balkan Megaprojects’ route, further proving that the US’ grand strategy is simply to transplant the Hybrid War destabilization template from the Republic of Macedonia northwards to the Autonomous Province of Vojvodina, though naturally adapted for its new intended victim’s particular local, regional, and national circumstances. The failure of the US’ repeated attempts to wage a Hybrid War on the Republic of the Macedonia and the uncertainty that an outbreak of war in Bosnia would drag in its desired Serbian target have both contributed to a reformulation of Washington’s grand strategy in trying to sabotage Russia and China’s Balkan Megaprojects. Instead of focusing on these two operational environments – both of which still remain active but are not being aggressively pursued at the moment – the US figured that it was time to open up a third front ‘behind enemy lines’ inside of Serbia itself, hence the ‘dog whistle’ signals that Croatian President Grabar-Kitarovic has been sending to Ustasha supporters across the border. The adapted stratagem is to have the radical members of the Croatian community there link up with their far more numerous Hungarian counterparts in orchestrating a series of Color Revolution disturbances that could then rekindle the start of an international demonization campaign against the Serbian government and divide Belgrade from Budapest. Croatia’s aggression against Serbia has thus made the jump from a conventional missile race to an asymmetrical Hybrid War on two separate levels, one of which is the state-to-state pressure that Zagreb hopes to bring to bear on Belgrade (and the potential that the premeditated media campaign could mislead Budapest into following suit), while the other is the non-state leverage that the Ustasha-Jobbik alliance could have in a complementary bottom-up fashion. The practical goal that Croatia and its US ‘Lead From Behind’ patron would like to achieve in Vojvodina isn’t separatism but federalism, hoping that at the very least this geostrategic chokepoint region would eventually be granted minority-ruled quasi-independence under a rebooted Serbian constitutional structure. The maximalist vision of this scenario sees all of Serbia carved up into regional-identifying statelets loosely bound together in a ‘Serbian Federation’, whereby the inhabitants of each zone have more loyalty to their regional identity than to their shared patriotic one as Serbs. While this eventuality might seem farfetched at the moment, Serbs have been progressively losing their national identity and unifying sense of patriotism ever since the 1999 War on Yugoslavia and subsequent imposition of a series of post-Milosevic puppet governments, so it’s not too extreme to forecast that the continuation of this trend would inevitably lead to the social fragmentation of Serbia into a collection of loosely connected Serbian-inhabited lands with time. Accounting for the involvement of identity-reshaping NGOs and the psychological trauma inflicted on Serbs by Kosovo’s occupation, Montenegro’s separation, and any forthcoming crisis in Vojvodina, then this scenario might be a lot closer to the horizon than many people feel comfortable countenancing. That doesn’t of course mean that it’s guaranteed to happen, but just that the federalization of Serbia is by far the most disadvantageous domestic development that could occur to the country aside from a civil or international war, though because of the asymmetrical threat that it presents and the potentially less violent nature of its progression, most Serbs might not even recognize this as a danger until it’s much too late. However, the worst-case scenario for Serbia wouldn’t just be the outbreak of Zagreb-encouraged violence in Vojvodina that could set this whole chain reaction into motion, but its concurrence with the thawing of the Hybrid War crises in Bosnia and the Republic of Macedonia, as this triple cocktail of chaos would encircle the country in a ring of crises and put the paralyzed state at the immediate mercy of its foreign adversaries.